This blog gets to go to all sorts of places for all kinds of events. On Friday it was Dundalk for a series of engagements and a few events. The town was busy. Traders have a hard time with the big out of town multiples eating into the retail business. Escalating rates and other charges make life difficult for small local shop keepers. Recession! Recession! Recession is the order of the day. But on Friday Dundalk was bustling. Especially in Eno’s opposite the Cathedral. I was there as a guest of Dundalk Outcomers. 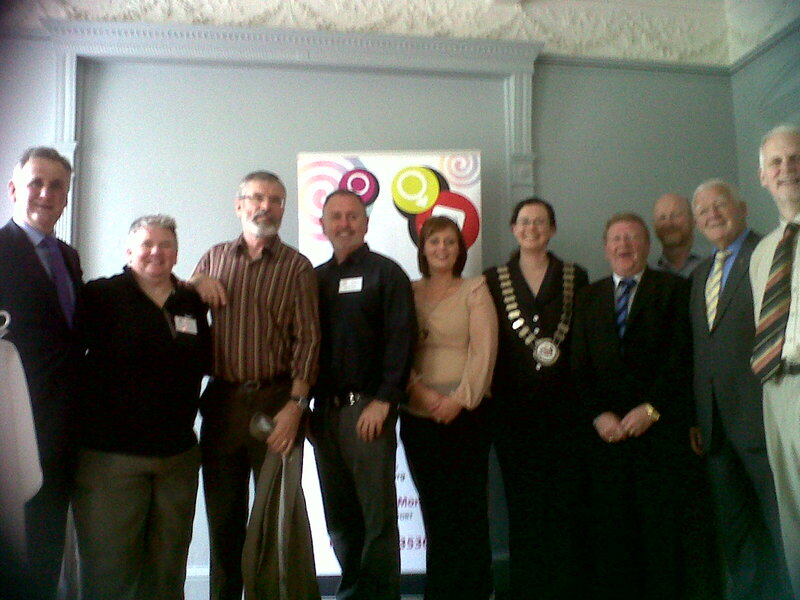 They, and this blog and other public representatives, were celebrating Dundalk Pride. The event at Eno’s is part of a celebration of the towns gay citizens. Other events include a table quiz, a film and panel discussion. Today, Saturday, is Pride Day. Pride Day is a fun day out for everyone with an outdoor café, funfair stalls, a travelling circus troupe and magic show, free workshops, music and holistic therapy treatments. The venue is Dundalk Outcomers Centre and Courtyard at 8 Roden Place. So if you get to read this blog on time dander along for a bit of fun or if you are a real party person then the Pride Party in the Radius Club is the place to be tonight. So who are the Dundalk Outcomers? They are a support group for gay, lesbian and bi-sexual people from Louth and the border counties. They run a drop in centre at 8 Roden Place. It is a safe and relaxed place for people to make social contact, meet for a chat or get advice. The centre is run by volunteer members of the Dundalk Outcomers Group. Bernadine is the co-ordinator. She is also funny, engaging and a brilliant advocate for our gay, lesbian and bi-sexual friends. Bernadine also promotes Lesbian and Gay health information and training. She spoke wonderfully well at the event at Eno’s. So did Billy. Billy is the chairperson of Dundalk Outcomers. John is the youth worker. If you check out the Dundalk Outcomers website you will see the range of services on offer. Or email info@outcomers.org. Bernadine can be contacted at Bernadine@outcomers.org and John at youth@outcomers.org. They do great work and this blog thanks them all for that. I hope they have a great Pride. As your man says all the time politics has to be about empowerment. Equality is the essence of republicanism. And equality is for everyone. That includes our gay, lesbian and bi sexual citizens. It is interesting to see Gerry, that all Irish people make up a Irish nation. Irish people of all types, make a citzen of pride. The world of change and needs, durning some real difficult. Equality is the essence of republicanism- it is words like that givea one great pride in being a Irish Republican. All anyone asks for is a chance to work with pride, in a new Ireland. Good man Gerry. You're right on there to be supporting LGTB community rights and equality. Also I think drugs should be legalised, quality controlled, trade licenced and taxed.